Our tools are designed to not only make you a profitable daily fantasy player, but also to cut down on your research and lineup creation time. Our optimizer and multi-lineup tools—which offer the ability to export and import up to 500 lineups onto DraftKings and FanDuel—will do just that. 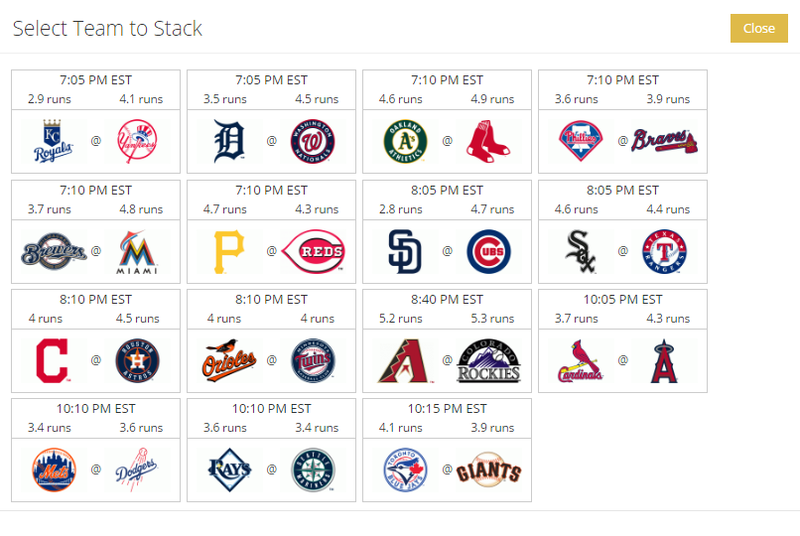 Follow along to learn how to quickly and efficiently generate many highly optimized lineups. An optimized lineup, based on the player ratings of the model, will then populate in the positions below. To remove a player from the optimized lineup, select the left arrow before their name. To exclude them from the model completely, hit the “x” on the right after their salary. If you remove a player or team from your model and want to add them back, you can do so by selecting “Excluded Players” next to “Optimizer” and then clicking on the left arrow next to their name. To get the most optimal lineup for your model possible, lock in a player or two before hitting “Optimize.” You can do this by selecting the lock symbol under “Lock,” which is the very first column in Player Models. Selecting the lock symbol will add a player to the lineup builder area. Once you have the players you want locked in, click “Optimize,” and it will generate the optimal lineup around the players you’ve locked in. You can also simply add players via the lock buttons until you create an entire lineup by hand, eliminating the need to optimize your lineup. This is especially smart in tournaments, as 1) you want your lineup to unique and 2) pure value is less important than in cash games. 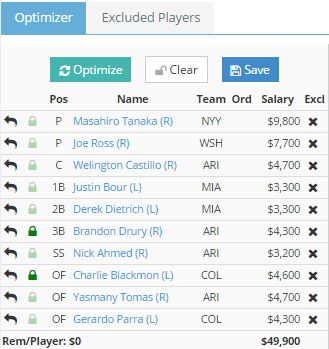 This will generate a pop-up window where you can first build a multi-lineup template before creating multiple lineups. 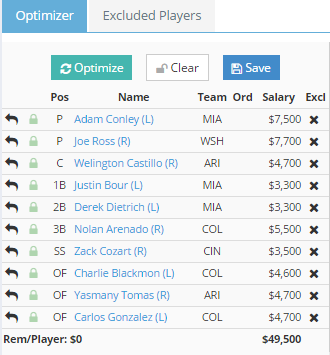 This default template for baseball is built to create 10 lineups, have a minimum salary cap percentage of 99%, not avoid the opposing pitcher, and not use the available filters. This is where you can build a template that fits your DFS style. 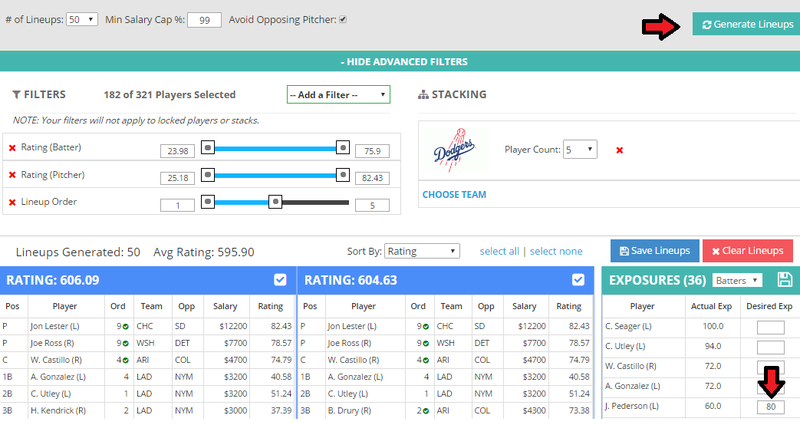 If you like to enter 50 lineups at a time and prefer to avoid taking batters against your pitcher, change your number of lineups to 50, click the button next to “Avoid Opposing Pitcher,” hit “Save Changes,” and name your template. Click “Save Changes” to re-save your template. 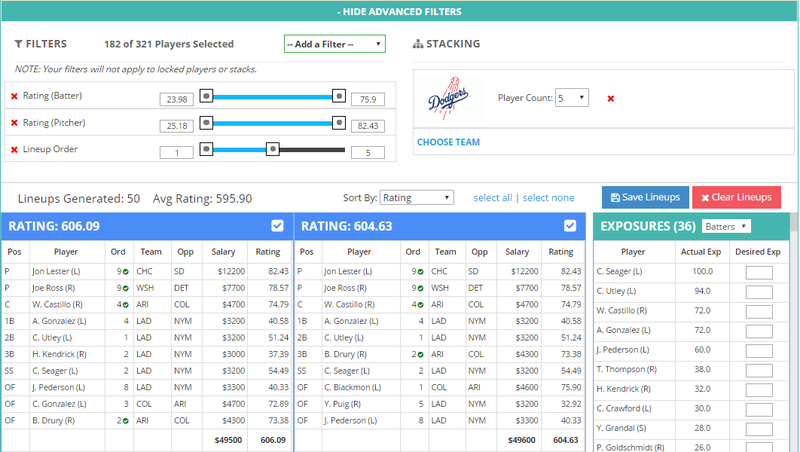 Now, your template is designed to generate 50 lineups (avoiding the opposing pitcher) that consists of only batters in the top five spots of their team’s batting order. Add as many filters as you’d like and remember to re-save your template before you close. If you want stack a lineup, click on the blue “CHOOSE TEAM” text on the right. This will generate a pop-up window of teams, much like you see in the team filter in models. Click on a team to bring them into your saved template. Let’s select the Dodgers. Clicking on their logo brings them into your saved template. From here, you will have to choose how many players to stack on the team – 3, 4, or 5 on DraftKings and 3 or 4 on FanDuel. If you’d like to add another team, repeat the process. If not, you’re ready to create your lineups. 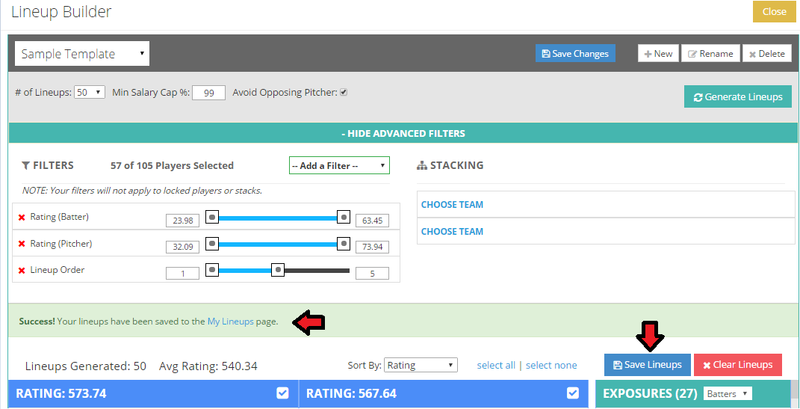 From here, simply select “Generate Lineups” on the upper right-hand side of the pop-up window and it will generate the lineups according to your template rules. As you can see, we’ve generated 50 lineups with five Dodgers batters. On the right-hand side of the screen, you’ll note a box that is titled “Exposures.” This is the percentage of lineups that a player is in. For example, Joc Pederson’s actual exposure on the right is 60.0, which means that he is in 60% of your 50 lineups, or 30 lineups. 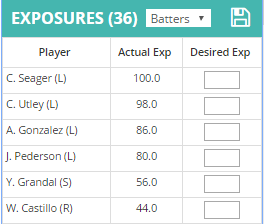 If you want to change a player’s exposure, type in the percentage of lineups you want them to be in, click the save icon above the exposures, and then click “Generate Lineups” again. After re-generating your lineups with your desired exposure, you will see that Pederson is now 80%. You can set exposure percentages in your model before you bring up the multi-lineup tool. Click on the blank box in a player’s row under the column “Exp,” type in your desired exposure, and hit enter. 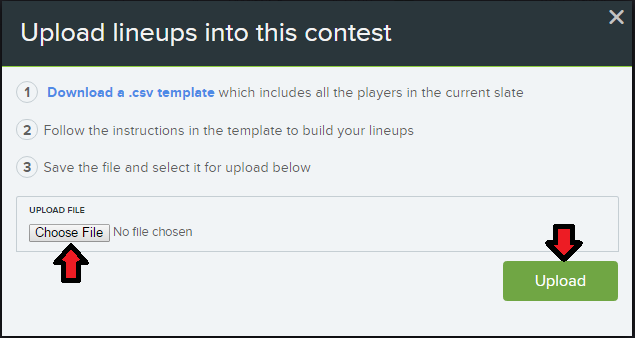 Repeat the steps to bring up the multi-lineup tool; when you generate your lineups, those players will have the desired exposure set in the models, or as close as possible. Now that your lineups are saved, let’s move over to the My Lineups page. You can navigate from the multi-lineup tool by selecting the “My Lineups” page link in blue text seen in the image above, or you can navigate there by clicking “My Lineups” on the top of your screen. Once you have moved over to the My Lineups page, find your saved lineups by navigating to the correct site and slate by using the filters at the top of the screen. Once you see your lineups, it will show you your exposures by position, with the lineups listed below. You can remove individual lineups by selecting “Remove” at the top of the lineup. From here, all that is left to do is export your lineups to a .csv, which you can do by clicking the “Export” button. To import your saved lineups into DraftKings, first nagivate to the Lineups page (https://www.draftkings.com/lineup). From there, select “Upload Lineups” at the top of the screen. This will bring you to a separate upload page. Click the green “Upload CSV” button on the right-hand side of the screen, select the saved .csv document from your downloads, and import into DraftKings. From here, it will say “Successfully Uploaded” and list your imported lineups. 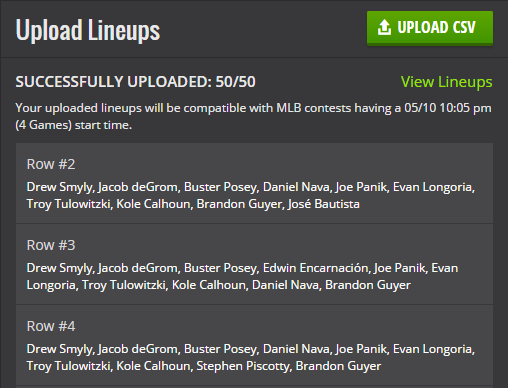 You can then navigate to the DraftKings lobby and enter contests using these lineups. Importing lineups into FanDuel is different than DraftKings in that you must import your lineups directly into a FanDuel contest. 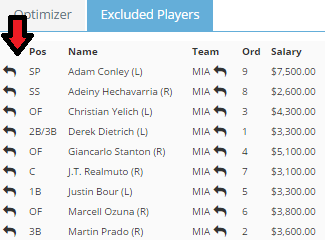 This will generate a pop-up window where you can import your lineups. Click “Choose File,” select your saved .csv, and click the green “Upload” button. If you have our iOS FantasyLabs app and have your push notifications turned on, you will receive alerts any time a player in your saved lineups on the My Lineups page is out. Whether you like to do your research early in the day or you can’t stay at your computer to monitor potential last-minute scratches, we’ve got you covered. Because there are fewer combinations in smaller slates, you may have to alter your filters in order to generate lineups. Some ways to do this include expanding your sliders to allow for more players, allowing your batters and pitcher to face, or lowering your salary cap percentage level.